For over a century, the Chicago bungalow has been not only an icon of contemporary urban culture, but it has also been a treasure chest of solid sustainable resources in an ever-shifting housing industry. In this city takes their bungalows quite seriously as evidence by the 2011 Historic Chicago Bungalow and Green Home Expo on Saturday, April 9 at the Merchandise Mart. Organized by the Historic Chicago Bungalow Association, this free, daylong event is the largest expo of it kind, spotlighting important issues in home restoration, preservation, energy-efficiency, and financing. The Expo is the site of the 6th Annual Richard H. Driehaus Foundation Bungalow Award Ceremony. Every year, the Foundation honors homeowners whose preservation work exemplifies the best in traditional Chicago Bungalow style. Admission to the Expo is free to the public. The hours are 10:00 am to 4:00pm. Parking is available, on the street or in nearby lots. The Merchandise Mart is easily accessible by public transportation. The CTA Brown Line train is the best option. It stops right in front of the building. 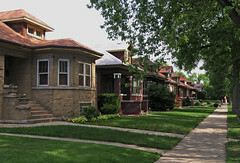 What do you think about the 2011 Historic Chicago Bungalow and Green Home Expo? Do you think it provides valuable information for home owners ? Share your thoughts and experiences. Register at the top of the page to receive updates from US Green Technology. This entry was posted in architecture, green businesses, green products, Green Technology, Historic Chicago Bungalow Associaion, merchandise mart, preservation, restoration and tagged bungalow, chicago, green products, Home Depot, Merchandise Mart, solar power. Bookmark the permalink.